Secure cloud-based workflow management solution for Third Party Administrators. Manage your workflow using an SSL-secured web portal that facilitates task tracking, time tracking, file storage & sharing, distributions, anniversary data requests, essential plan information, contact information, mass e-mailing, and private messaging. Tools for administrators include birds-eye-view reports, permissions management, global interface settings, and mass-update facilities. 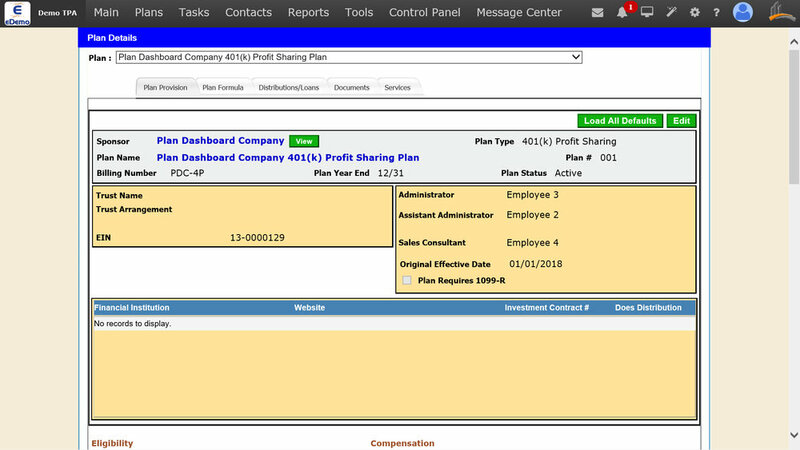 The Plan Sponsor Portal allows your clients to send and receive information over an encrypted connection and stay up-to-date on anniversary data requests, distributions, and plan information. Organize your workflow and spend time on more important activities. The intuitive, easy-to-use design allows you and your staff to track tasks for annual administration, distributions, or other plan-related projects. Choose from a full list of pre-defined workflow templates or create your own from scratch. You and your staff will have the ability to fully customize, track, and update your workflow. This includes custom reporting capability to provide managers access to workflow status at a firm-wide level. TPA firms and pension professionals create, store, and share sensitive files every day. EBG Systems can give you peace of mind and accessibility that will set you apart from your competitors. Our file management system allows you to securely store all of your plan related and business documents in one location. Easily organize, share, and archive your documents anytime and anywhere. Send files to clients, receive updates on file uploads and downloads, and customize your folder structures. The Plan Sponsor Portal gives you and your staff the ability to collaborate with all of your clients through a secure web-based interface. The fully customizable portal allows you to brand the site as your own, integrate with your existing website, display your corporate logo, and more. Impress and effectively serve your clients with features such as automated annual data collection, file sharing, distribution submission, and census auditing. Reduce the time spent on the annual data collection process by allowing your clients to securely enter and approve collection packets online. The Mass Mailer can send emails and files to any number of clients and contacts. Leverage a system that is fully integrated with the Portal's workflow, plan and contact databases, and file manager. Give your staff the means to efficiently send emails to clients overdue on 5500s, notifications for Anniversary Data Requests, or company announcements. Unlimited templates can be created to ease the task of sending regular emails. Get a complete picture of all your contacts in one location. 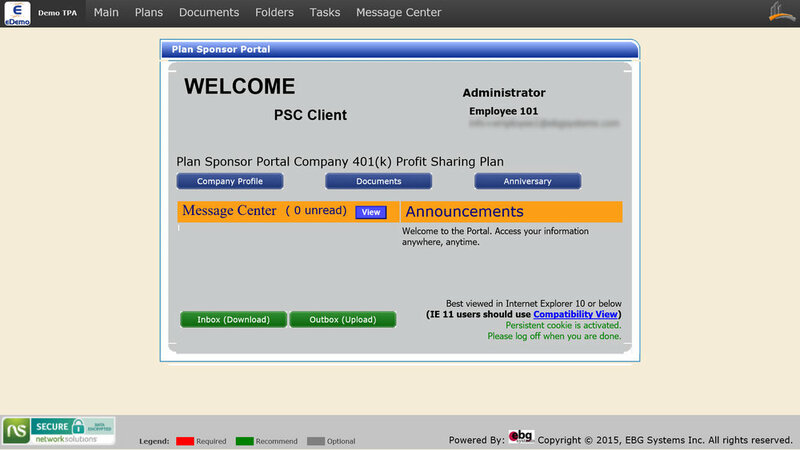 The Portal stores your contacts, plan sponsors, trustees, clients, employees, and more in one location. With seamless integration, our contact management system makes it easy and convenient to send out emails, assign tasks, track time, and generate reports. Navigating your daily business tasks has never been this easy. With the dashboard, you can view and manage all aspects of your business. 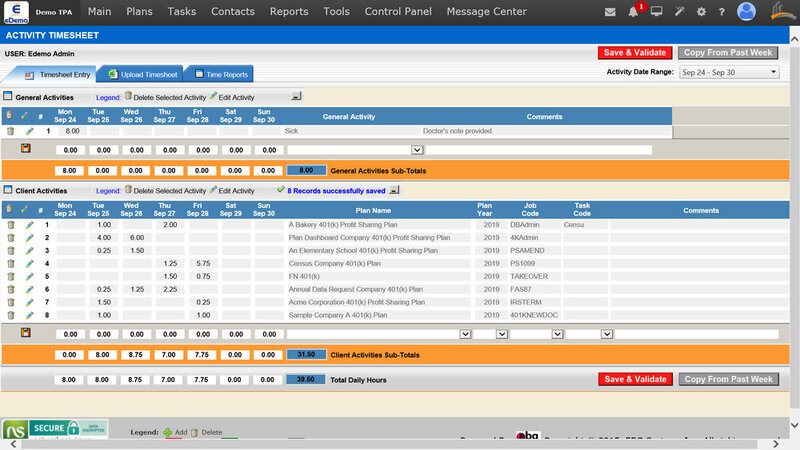 File storage, contact management, deadline tracking and other important functions are available in a single interface. While in the Portal, the dashboard can be opened at anytime, giving you the ability to efficiently access important information. By allowing for multiple sessions and organizing all of your work materials through one interface, the time and energy required to complete key business tasks is greatly reduced. The Portal's time tracking and billing modules feature rich applications that fit all of your needs. With seamless data integration, dynamic reporting, and management tools, our intuitive time entry interface will automate and organize your time tracking processes. This value-added platform offers benefits to both large and small business. By quickly and accurately capturing time, the Portal can reduce the effort and expense of time management. At EBG Systems, we take our clients seriously. That's why we offer unmetered customer support with any Pension Portal subscription. This means you can ask as many questions and request as much training as you need without incurring any additional charges. Every year we take customer feedback or personal requests and turn them into the latest Pension Portal features. How Can the Portal Benefit My Company? The Pension Portal offers you the advantages of cloud computing technology. You can access resources, products, and information over the internet. There's no need for downloading or installing software to your personal computer, the Portal is accessible through any modern web browser. Read more about the benefits of cloud computing. Contact us to schedule a demo, for pricing information, or to ask any questions.